While we all wait for the iPhone 4 to ship, I've been playing with the Sprint/HTC EVO 4G phone. Of the three Android phones I have tested, it's the most impressive. I've been reflecting on the key features of the iPhone 3GS, iPhone 4 and EVO 4G. Here are what I see as the advantages of each over the other. Many of you (like me) currently own an iPhone 3GS. So is the iPhone 4 worth the cost of updating? Since the 3GS can run iOS 4, why should I upgrade? Let me summarize the features that cause me to say, "Duh!" The Sprint 4G (WIMAX) data network is faster than AT&T's 3G data network. Where not available, 3G works fine -- even in Death Valley, CA. Both phones record video in 720p but EVO has an HDMI port that outputs 720p while the iPhone 4 uses a dock adapter to component video cables that output 480p or 576p. 8mp backside camera beats Apple's 5mp camera in resolution, though Steve Jobs asserts "image quality also depends in large part on other factors, and the iPhone's backside-illuminated camera sensor with large pixel sizes allows it to deliver excellent image quality under normal and low-light situations." That's supported by MacRumors forum postings of EVO owners who say photos on the EVO are "grainy." The EVO 4G is a worthy competitor to the iPhone. I admire Sprint. They are the "we try harder" company in the mobile communications world. But after 30 days, we returned the EVO to the Sprint store. 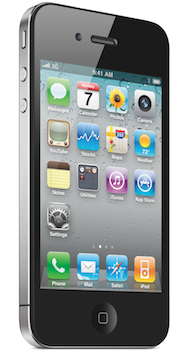 The Apple iPhone 4 is our choice for the best smart phone. Even with the "teething" problems such as signal loss when you hold it a certain way or the proximity sensor oversensitivity, it's still an impressive upgrade to the iPhone 3GS and raises the bar for competitors to reach. 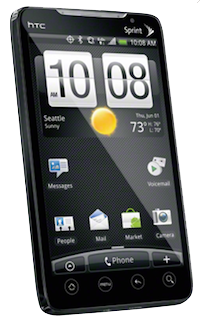 Verizon hopes to steal some of the iPhone 4's thunder on July 15th when the Droid X appears in their stores. But from the early reports and spec sheets, it offers the same basic features of Sprint's EVO. What would be more impressive is if Verizon offered a version of the iPhone that supports 4G (LTE, WiMAX) data networks. That could happen as early as January 2011. Piecemeal, Manual Sync/Backup: Finder can copy music to MicroSD card and apps from MicroSD card; iPhoto can capture photos; third party apps can backup Contacts and Calendar to Google "Cloud"